A minor road leaves the A831 about four miles east of Cannich and eight miles west of Drumnadrochit. Three quarters of a mile along it is a large parking area on the left, a hundred yards or so beyond which is the Corrimony Chambered Cairn, an unusually well preserved passage grave. Access to the cairn is via a footbridge over the minor stream beside the road. What you find is an intriguing doughnut shaped structure some 60ft in diameter surrounded by standing stones and, perhaps, by a shallow ditch and low mound. The central cairn is well defined and made from fairly weathered rocks. In the centre of the cairn is a circular chamber, now open to the sky, reached via a low passage which enters the cairn on its south western side. The passage is low enough to require a crawl, but is well worth the effort. 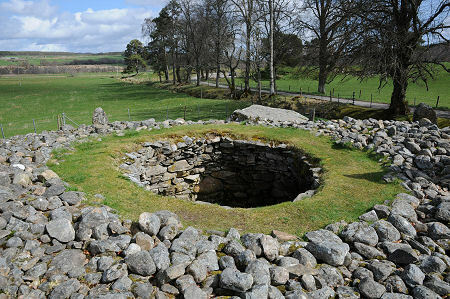 Parts of the passage roof are believed to date back to the original building of the cairn. The central chamber is slightly corbelled in, which means that while it is possible to look down into the chamber from the turf walkway grown on the top of the cairn around it, anyone interested in getting into or out of the chamber should use the passage. The edge of the stones surrounding the rim of the chamber looks unlikely to support the weight of anyone trying to clamber into or, especially, out of the chamber, over the edge. Lying on the upper part of the cairn a little to the east of the central chamber is a large fairly flat piece of stone. 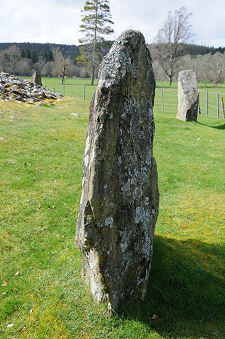 This is believed to be the capstone which would have roofed the chamber at a time when the cairn rose to a rather greater height than it does today. This is said to have lain on the west side of the unexcavated mound housing the cairn until 1830, when it was moved (presumably with huge effort) to the top. This may have happened after the central chamber was dug out by an antiquarian at about this time. The capstone appears to have lain in its current position since the cairn was fully excavated in 1952. 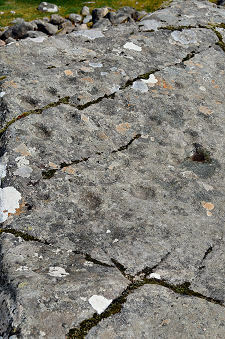 A particularly interesting feature is the considerable number of cup marks carved by our distant ancestors into the upper surface of the capstone. 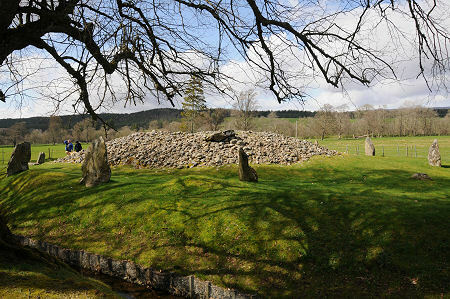 The cairn is surrounded by a ring of eleven standing stones, some appearing to be planted in the bottom of the shallow ditch referred to earlier. There is a space in the ring where you would expect a twelfth stone to stand, but excavation suggested it was probably never put in place. Excavation also revealed that four standing stones on the side of the cairn nearest the entrance to the passage had been re-erected at some point, while two more had been put in place in comparatively modern times (i.e. the last couple of hundred years) having originally formed lintels for the passage roof. None of the standing stones are much more than about 6ft in height, but the collective impression they create is a highly impressive one. In 1875 it was said that one of the standing stones on the north east side of the cairn had cup marks carved on its outer face, but no trace of them is visible today. The cairn is believed to have been built some 4,000 years ago, and from faint traces found in 1952 is believed to have been the last resting place of a (presumably very high status) woman. No grave goods were found, though a single bone pin did emerge during the excavation. It is probable that the cairn was built first, with the entrance being blocked off after use. Some time - perhaps many generations - later, the stone circle was added around the outside.